Results are in from yesterday’s Tahoe Fall Classic, where Aussie Beau O’Brian took out the 22 miler to continue his solid pre-Battle form. 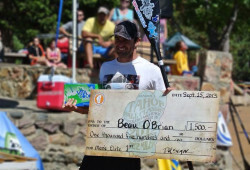 Ben Sarrazin and Rob Rojas filled out the 14 foot podium while Gail Vento dominated the women’s race. The Fall Classic was the third and final leg of the 2013 Tahoe Cup, following on from the Donner Lake and Jam From The Dam races.